Are you working for eLearning projects? 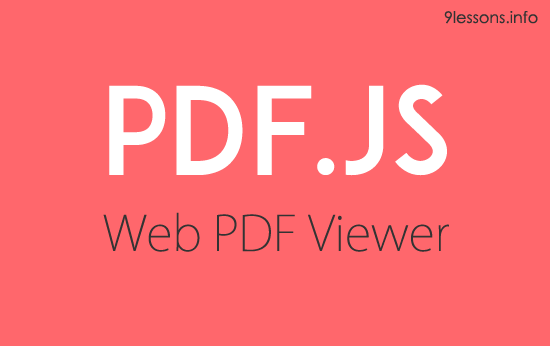 then you should know about Mozilla has launched PDF.js a web PDF viewer plugin. This plugin helps you to display PDF files inside HTML code. I did customized PDF.js prebuild structure for easy usage. Take a quick look at this post and it will explain you how to configure, tracking reports(Google Analytics) and monetize your PDF content with HTML page. The plugin contains four folders called build, css, js and images with HTML files. Just rename file.pdf with your PDF file. Its Not working ! cant view the pdf file and even on your demo..
Now transform html article in pdf file, possible ? Very nice a article. Many-many thanks to you. I hope this will very helpful for displaying pdf data in html page in specific size as well as specific location on the web page. The idea seems to be great. Hope other web browsers can follow suit. So we web designers can ensure the same good user experience across browsers. Try live demo with modern browsers. It is so good. But how can i take out the download button. I just view the pdf only, can't download it. please help me. Thanks a lot for that! does it work locally ? How can change the viewer Locale ? great job, it will be more helpful to those who are maintaining educational blogs to post their pdf files on the website by that users can view entire documnt without downloading . Thank you, this is actually something we were looking into and I didn't know it already existed or was that easy to set up. Thanks for being so generous with your scripts! Hi everyone, i don't think it is secured yet...i was able to download the pdf...infact their was a download button just after the print button....is there anything wrong ? This is a very good script but I really need to know how to disable the download, open and print functions. Thank you. Message: Unexpected server response (204) while retrieving PDF "http://localhost/testando/webpdf/standard.pdf". can you please tell me, how to display all thumbnail in sidebar ? how to pass selected database file name to this default url? Hello, Nice script. But what is the cmaps folder/files for?. It semes to work with out this folder. Thank you. Do you know how can i prevent someone to download and print the pdf file with pdfjs?